The Lake Champlain Basin Aquatic Invasive Species Rapid Response Task Force today released seven recommendations to slow the spread of spiny water flea into Lake Champlain. The Task Force identifies preventing the flow of excess waters from the Glens Falls Feeder Canal to Lake Champlain by diverting that flow into the Hudson River drainage as the most effective option to slow the spread of spiny water flea. 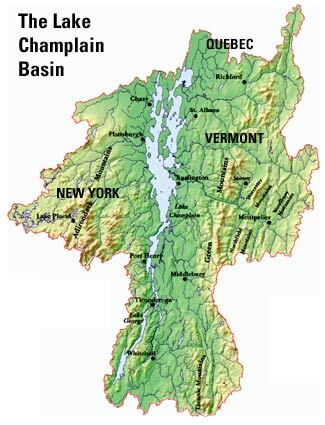 The Task Force also seeks completion of a feasibility study to identify a hydrologic barrier to prevent the movement of aquatic plants and animals between the Champlain and Hudson Watersheds through the Champlain Canal system. This long-term solution will prevent the canal system from serving as a vector for any aquatic invasive species from moving in and out of the Lake Champlain Basin. The Task Force recognizes that the quick closure of the Champlain Canal and Glens Falls Feeder Canal, which could control and eradicate spiny water flea, is not technically, legally or economically feasible. After monitoring and sampling efforts determined the presence of spiny water flea in the Champlain Canal and the Glens Falls Feeder Canal in June, the Task Force undertook a significant process to identify and review a number of options to prevent the spread of spiny water flea to Lake Champlain. The Task Force carefully considered the effectiveness and technical feasibility of implementing behavioral, chemical, biological, physical or mechanical interventions in the Champlain Canal to prevent the introduction of spiny water flea to Lake Champlain. Pursue options to redirect surplus flow in the Champlain Canal into the Hudson River side of the system and away from Lake Champlain side of the system as it is currently directed. Undertake the U.S. Army Corps of Engineers’ Champlain Canal Barrier Feasibility Study to identify means of developing a hydrologic barrier in the canal system. Increase and enhance sampling efforts by the New York State Department of Environmental Conservation in the Champlain Canal and Glens Falls Feeder Canal to determine the extent and levels of spiny water flea populations in those waters. Issue a public service announcement from the New York Canal Corporation alerting canal traffic about the presence of spiny water flea and educating boaters and anglers how to prevent its spread. Build a predictive model of lake susceptibility to spiny water flea with support from the Lake Champlain Basin Aquatic Nuisance Species Subcommittee to identify the lakes most susceptible to invasion by the spiny water flea. Target those lakes for intensive education and outreach spread prevention efforts. Expand the lake steward/greeter program and provide more information on spiny water flea, and pursue stewards dedicated to the canal system. Seek the resources to print significant numbers of spiny water flea watch cards, and distribute them and other aquatic nuisance species spread prevention information to canal users and other key user groups. Boats moving north and south is in the millions of dollars. Lets close the Chambly river too while were at it. We will turn Lake Champlain into a giant pond. Ridiculous……come on Senator, you’re smarter than that! Nice knee jerk reaction to pander to the enviromental crowd…..now come up with a realistic solution. Truth is, almost all efforts to stop “invasives” are futile.